Arthur Streeton produced the painting “Fires On” in 1891 at a time when there was a dawning awareness of the greatness of the Australian Landscape and it’s people. A century had passed since the English settlement and the birth of the Australian Federation was eminent. The harsh life of the bush along with the resilience and sheer necessary creativity of it’s people had been romanticised in the works of Henry Lawson (1867–1922) and Banjo Patterson(1864–91), the shearers, the drovers and the swagman where becoming legend, there was intense curiousity and fear surrounding the indigenous Australians and the uniquely beautiful native flora and fauna were being illustrated and published in scientific journals. All of this led to a sense of pride in the Australian way of life and a desire to represent the country in all it’s harsh beauty accurately, it was no longer acceptable to mix nostalgia with fact and paint the Australian landscape in a Brittish attitude. 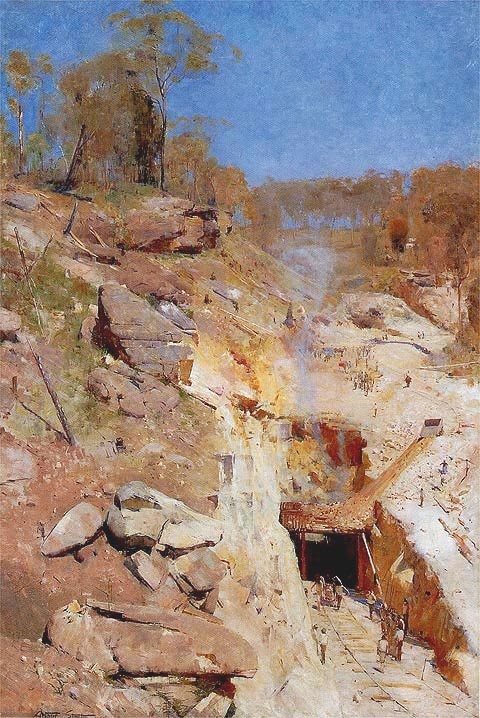 With regard to the painting “Fire’s On”, Arthur Streeton, the artist spent many days at the site of the Lapstone Tunnel as it was being constructed, sketching and completing studies in watercolour, often lamenting the medium drying too quickly in the heat. In a letter to Frederich McCubbin he described the landscape and his subsequent choice of pallet as “a perfect blazing glory of white orange cream and blue streaks here and there where the blast has worked its force”, as he endeavored to capture this initially in watercolour and later in oil. He appears to have established a rapport with some of the workers throughout the time he completed his studies, commenting on their interest and appreciation of art, and of taking cover together from the blasts “work a while -then again "Fire! Fire's on" - and off we go, and then work again”. The surprise death of a worker became a subtext of the final painting, an unexpected addition whispering from the mouth of the tunnel amidst the scale and prominence of the mountain. 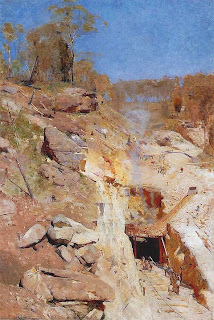 “Fire's on” captures the essence of a distinctly Australian theme, and is “possibly the artist's greatest evocation of Australian heat and sunlight”. 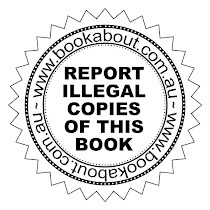 It is successful in depicting the landscape’s harshness in the sheer exposed rock faces and the stoicism of the Australian people, seemingly insignificant but ever forging through and into the heart of Australia.